Firstly, the host of HZS60 ready concrete plant and feeding ingredients system should be set according to time limit of project, the whole amount of concrete, etc. It is better to meet the daily biggest concrete volume. 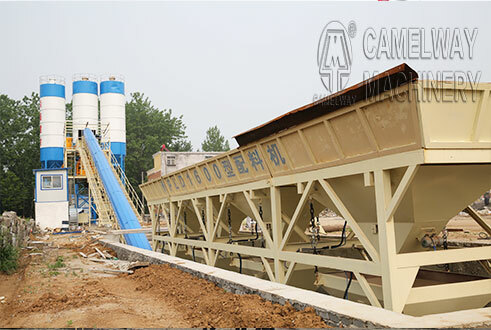 A set concrete mixer and relevant batching system are composed of a production line. General engineering can set only one production line, but the bigger and more important project can set two production lines to ensure uninterrupted supply of concrete for engineering. A project can set only one HZS60 ready concrete plant and also can set the plant according to areas. Secondly, the coverage of sand and stone should be big enough to meet the needs of project. It is also convenient for the supplement of materials. Sand and stone should be placed in different areas so that the mixed materials can be prevented. The loading truck should be equipped with according to feed materials. The site should be hardening so that the loading truck can be convenient to load. And the mud and other impurities can be prevented. Thirdly, one HZS60 ready concrete plant is equipped with two water pools which must ensure the water requirements of machinery. A production line is equipped with at least two cement silos, and three silos are better, which can be used in turn. Finally, as for the delivery way of finished concrete, we can choose pump. This delivery way can meet the requirements of distance and height according to supply volume. The pump often is set before the concrete mixer. How to efficiently manage a concrete batching plant?